Keratinocytes are cells which cover the skin. 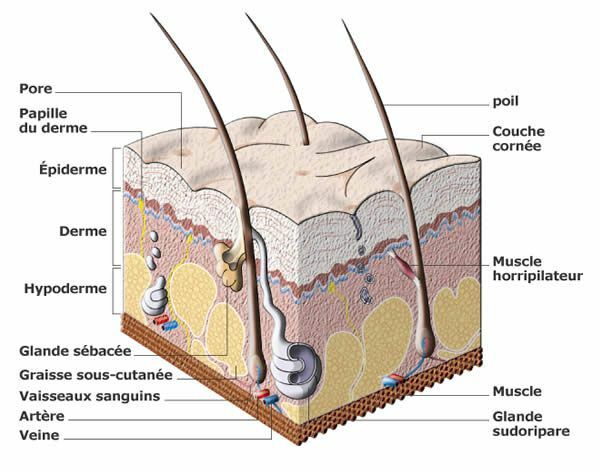 A cell forming the superficial layer of the skin (epidermis) and integument (nails, hair, body hair/fur, feathers, scales). They are constantly renewed. Keratinocytes need a month to pass from the basal layer (the lowest layer) to the stratum corneum (the highest layer). The keratinocytes are no longer alive at this advanced stage. They are scales, cells which have died as a result of apoptosis. A synthesised keratin, a fibrous protein which is insoluble in water which gives the skin its waterproof property. Keratinocytes also help to protect the skin against ultraviolet radiation by accumulating melanin in melanosomes, which are produced by the melanocytes. Melanin is stored in the nucleus where it protects DNA from damage due to exposure to sunlight.